We can write what we like about ourselves on this website, however the comments on this page are from customers. If you would like to know more please call or email us. "Dudley, Thanks, for the help from your guys yesterday they did a good job." "I wish to place on record the great assistance that your Hamilton based team under the on site guidance of Ernie gave to Acrow at the recent Hamilton V8 event. Your team are to be congratulated on performance and presentation and a difficult job done safely. Please pass on my thanks." "With the completion of the $165 million Te Rapa Powder project behind us, it seemed appropriate to write you a note to congratulate on your excellent service provided to the project, and your attention to safety issues. "A-Z Rigging & Scaffolding Ltd are currently used for scaffolding duties at Contact Energy's Wairakei, Ohaaki and Poihipi power station sites. At all times the company demonstrates a high standard of workmanship, safety and safety documentation and the ability to respond in a timely fashion to planned work programmes and emergency call-outs. Over the past eighteen months this company has been involved in numerous large scaffolding contracts (many at the one time) working to very tight time schedules. Their ability to draw on extensive supplies of equipment has made this possible." "At all times we have found the management team from A-Z to be thoroughly competent and cooperative in their ability to perform the required tasks. "Thank you for your assistance during the repair of our press cylinders and hydraulics. Without your commitment...we would have been shut down for a longer period. It is reassuring to know that companies like you are available to provide help when we have a crisis." "A-Z Rigging & Scaffolding are our preferred Contractor for any work at our plant. We have found them very prompt and efficient in any work they have done for us. We have no hesitation in recommending them for work with any other company." "...we would like to thank you and your staff for the efforts everyone put into making this a successful shut...your efforts were very much appreciated." "I was especially pleased with the care of Company equipment and regard to safety exercised by your company and Mr. G Mead, during the lifting of our Tank 17 for the replacement of damaged annular plates, earlier this year." 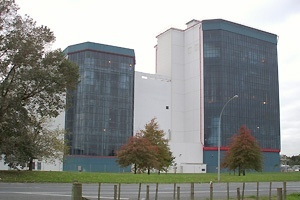 "A-Z rigging were contracted to undertake the rigging and scaffolding for all aspects of the Plant expansion at the DYNOCHEM Plant in Bell Block, New Plymouth. This expansion was undertaken while the existing plant was in production. They have a sound knowledge of all aspects of their work, from the steel erection to scaffolding. They worked very closely with Production and Construction groups, to effect a safe and speedy expansion." "We would like to take this opportunity to congratulate you and your team for a job well done (on the Anchor Products Reporoa Stage One Capacity Upgrade)...We would have no hesitation in having your firm work on a project with us in the future." I was especially pleased with the care of Company equipment and regard to safety exercised by your company and Mr. G Mead, during the lifting of our Tank 17 for the replacement of damaged annular plates, earlier this year."